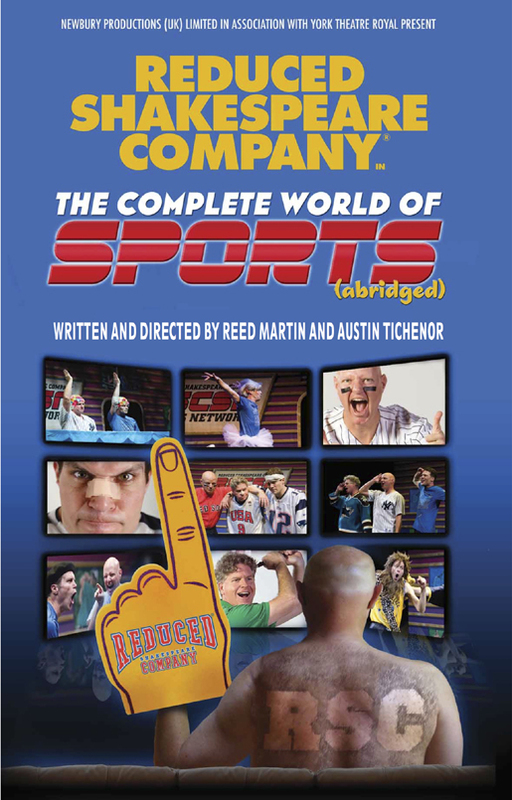 Timed to coincide with another international sporting event taking place in London this summer, the RSC will present the European premiere of its seventh “fast-moving and deeply funny” (Boston Globe) stage show, The Complete World of Sports (abridged). * Is darts really a sport? * What does NASCAR stand for? * Why do Americans insist on calling a contest in which only they compete a “World Series”? * Who invented wife-carrying, bog-snorkeling, and cheese-rolling? * And why aren’t they in the Olympics? Whether it’s the ancient cavemen or the Classical Greeks, the Romans, the Elizabethans, or the modern sports media, The Complete World of Sports (abridged) brings you all the emotion, the drama and the random drug testing of sports. Fresh off a highly successful US tour and hugely popular runs in both New York and Washington DC’s Kennedy Center, the RSC’s five week UK tour begins at the York Theatre Royal, followed by stops in Buxton, Exeter, Newbury, Nottingham, Truro, Poole, Canterbury, Leamington Spa, Derby, Hereford, Rhyl, Barnsley, Salford, Basingstoke, Crawley, Bedford, and Tewkesbury before continuing on to the Arts Theatre in London. Click here for a complete list of dates, venues, and box office information. The RSC’s return to the Arts Theatre marks a reunion of sorts, as the company performed a year-long run of its signature show The Complete Works of William Shakespeare (abridged) there in 1992-1993, before their almost ten year record-breaking three-shows-in-rep run of Shakespeare, The Complete History of America (abridged) and The Bible: The Complete Word of God (abridged) at the Criterion Theatre in Piccadilly Circus from 1996 to 2005. The company is thrilled to return to the UK after too long an absence. Let the games begin! * Listen to creators and stars Reed Martin, Matt Rippy and Austin Tichenor share their excitement on the award-nominated Reduced Shakespeare Company Podcast here. * Watch video excerpts of The Complete World of Sports (abridged) here. * Like the Reduced Shakespeare Company on Facebook. 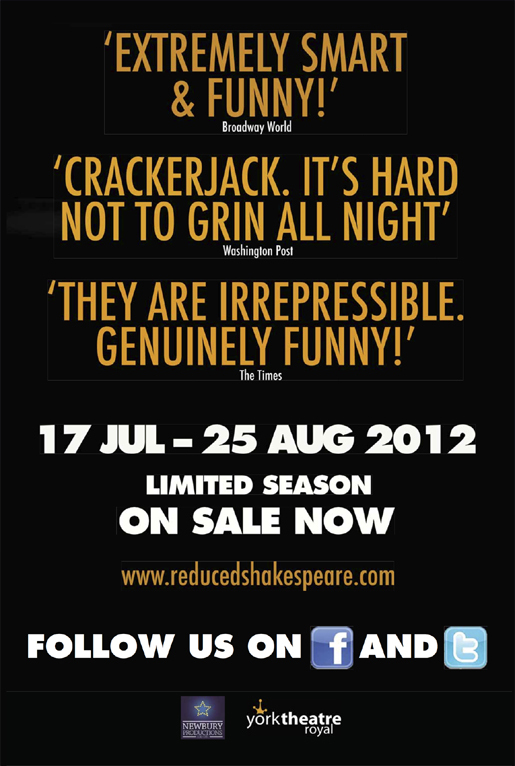 * Follow the Reduced Shakespeare Company on Twitter. * To Buy Tickets for the Arts Theatre, click here. I am hoping to see you guys in Barnsley this weekend. but also hoping if i can’t make it that my dear country has done enough to entice you all back another time. Mr Matt Rippy, you are still a better dancer than John Barrowman, I said it at Hub 2 and I still say it! ¡Gracias, amigo! Thanks for coming and participating! I have been in Poole, Dorset tonight, was absolutely briliant, it was fun and I just did my performance in England. I am Spanish and I did the mexican, the transilvanian and running the bulls like in Pamplona, very familiar. You are absolutely fantastic. BRAVO. Saw your show last night, brilliantly funny.Well done, loved it especially the synchronised swimming. You’re not as sad as we are, I promise you! I am also saddened that you will not come to Scotland. I have been a big fan for many years, seen many of your shows and want you back in Glasgow. And Norwich gets added to the schedule – Booyah! Booked and booked. Have booked to see you in Peterborough in June and I’m so tempted to book to see you at the London Arts Theatre too!!! Saw the complete works of Shakespeare abridged back in India in 2005.. Would love to see a repeat of that show in scotland.. U guys are amazing! !